I initially called this pattern Hexagon Tessellations because it was designed to tessellate (fill an area with interlocking repeating units) around a hexagonal grid. This has been one of my most fertile designs ever. I originally drew it on paper and then scanned the lines into the computer. This was the first pattern I tried this with and the results were fantastic. I found that by altering lines in the repeat unit I could quickly play out different tile patterns in Photoshop. To date I have developed two different vase patterns, three platters and several tile schemes from this one design. To draw each of those ideas out by hand would have taken around ten hours apiece, I was able to do each in half an hour on the computer. This was the pattern that sold me on the merits of using the computer as a design tool. I later noticed that the central motif, the Star of David, was surrounded by six smaller Solomon's Seals. King Solomon was actually King David's son, so now I call this pattern Two Kings. A version of this design is available as a repeating tile pattern and it looks incredible when it fills an area. Visit the Tiles and Coaster link to see a sample. 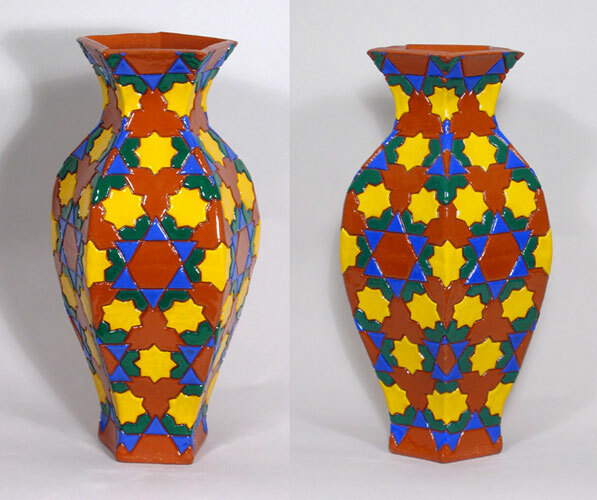 Most of my vases use traditional patterns, but this one is my own design. I use dental tools to clean up the lines and I tweak the pattern a little to get it to connect on the edges. The inspiration for these vase shapes actually came from Chinese Bronzes, which I studied when I was in college. These vases look great with flowers in them! Terracotta tends to sweat when it is filled with water. Use a coaster underneath to protect your furniture if you are placing a vase on a wooden surface.